The Parish Planning and Building Committee is responsible for the maintenance of the facilities to provide a safe, clean, comfortable and inviting environment. The primary responsibility of the Pastoral Council is pastoral planning. The members prayerfully investigate and ponder issues of concern to the whole community and make recommendations to the pastor for goals and actions. Areas of concern include matters pertaining to the life of the whole parish: Leadership, Faith Formation. Worship, Social Ministry, Youth and Young Adults, Evangelization, Stewardship, and Community. The council is consultative and advisory to the pastor. Together, they assess the work of the parish ministries in response to the pastoral plan, help the ministries in response to the pastoral plan, help the ministries address obstacles to implementation and evaluate the progress on the goals to determine if outcomes have been met. Goal Statement: To welcome and be available to everyone with all our heart and soul, from arrival until departure from the church parking lot, to profess St. John Apostle and Evangelist as a Spirit-Led stewardship parish. Objective: By November 30, 2016, the Evangelization & Stewardship Ministries will have programs in place that will be geared to increase the number of active parishioners, the number of new parishioners, and parishioner participation in Mass and church activities. Goal Statement: St. John Apostle & Evangelist Church would like to develop a marriage and family life program in order to build dynamic marriages and families. Objective: Increase in participation of marriage preparation; increase in sacramental marriages at St. John; increase in attendance in Natural Family Planning (NFP); increase participation in marriage family events. Goal Statement: To promote a better understanding of the Mass rubrics and improved quality of homilies in order to give parishioners a stronger spiritual and faith renewal experience during our time for worship. Objective #1: By November 2017, the Liturgical Ministry will have conducted the necessary training to increase reverence throughout the Mass by parishioners and ministers. Objective #2: By July 31 2015, the St. John Apostle & Evangelist clergy will have made the final decision in making shorter homilies which are more relevant to our daily lives. The 12 team coordinators will form the commission. The pastor will appoint the commission chair. Goal Statement: To increase our student enrollment in RE and RCIA, in order to facilitate the conversion of the whole person into a dynamic Catholic Christian. Goal Statement: to give Catholics the opportunity to learn their faith and why it is the one true faith to help parishioners develop a deeper relationship with Christ. Objective: Increased attendance / participation at Mass, in ministries, volunteer events and programs. Goal Statement: To welcome, recognize, and retain the youth & young adults of our St. John Apostle and Evangelist community and to foster the personal & spiritual growth of each young person in our YA Ministry. Objective #1: By December 31, 2016, the parish will have a YA Ministry in place that will foster an increase of participation in YA activities and will offer personal and spiritual growth for each young person. The Finance Council assists the pastor with the management of parish funds. 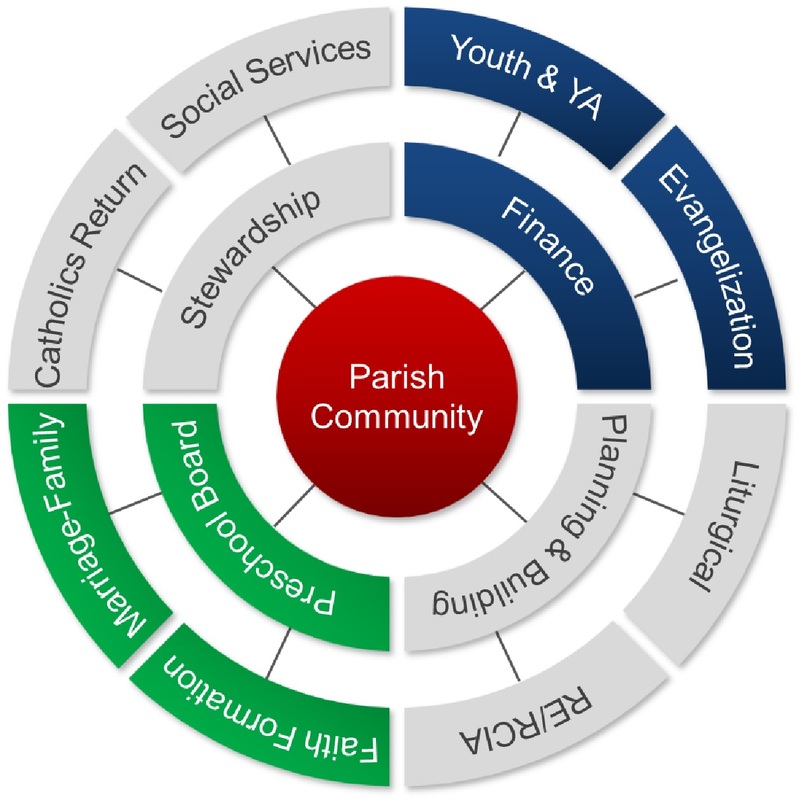 Using the Parish Pastoral Plan as a guide, they do long-range financial planning to help insure that funds needed to achieve the goals are available. They work with parish ministry leaders to help them create budgets that reflect the goals for their particular ministries. If funds need to be raised, they oversee any development efforts in the parish. They monitor the spending of the funds and provide the Pastoral Council with information needed for their assessment and evaluation responsibilities. They are a resource to the pastor.